Halfway to Oktoberfest at Reichenbach Hall - Oak Beverages Inc.
Halfway to Oktoberfest at Reichenbach Hall, Tuesday, April 2nd, 5pm – 10pm. 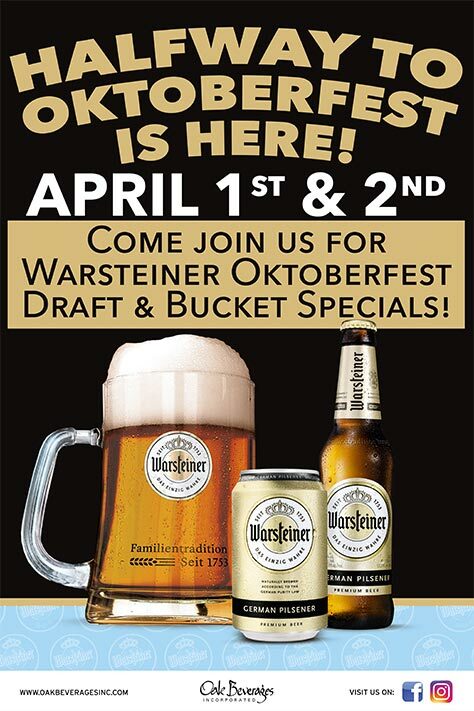 Come join us for Warsteiner Oktoberfest Draft & Bucket Specials! Warsteiner Pilsner, Oktoberfest, Konig Dunkel, and Oktoberfest on Tap. When two Germans immigrated to New York City back in the first half of the last century, they brought with them a hearty appreciation for German culture, German food, and especially German Bier. Willy and Gerda raised their family in their humble New York City home, but weekends were anything but humble for the Reichenbach clan. Gerda spent hours in the kitchen, and when everyone arrived, a sumptuous repast of cold cuts, sausages, schnitzels and other German specialties were served along with loaves of pumpernickel and rye bread. Of course, the family discussions were always lively thanks to the salutary effects of their favorite beverage. A festive mood warmed the hearts of all who attended these little Oktoberfest like parties every weekend. As it turns out, a couple of the grandchildren grew into adulthood and their passion for great food never waned; but intensified. Not surprisingly, these boys also developed a healthy appreciation for good German beer. With memories of weekends at Willy and Gerda’s always in mind, Keith and Willy Reichenbach, a.k.a. the “Beer Brothers, ” developed the concept for a great German beer and eating hall where it feels like Oktoberfest every day. Reichenbach Hall is here for you today. We hope you enjoy it. Prost! Posted in Featured Promo, Oktoberfest.